The once-scorching stock lost 50% in the last month. Investors may be taking the challenges posed by the balance sheet more seriously. Northern Dynasty Minerals (NYSEMKT:NAK) is sitting on one of the largest undeveloped gold and copper reserves in the world. On paper, that makes it a stock with plenty of potential if the asset can be developed in a shareholder-friendly manner. When Donald Trump was elected president, and promised to enact an agenda focused on deregulation, investors assumed the odds for that occurring had significantly improved. Of course, things aren't going to be that easy, and investors have exited the stock en masse in the past month. While the rapid sell-off could be explained by several short-term factors, there are several long-term factors that don't bode well for Northern Dynasty Minerals' success. Here are two red flags on the company's balance sheet that should make you think twice about the stock. Admittedly, there isn't much to the company's balance sheet. That's because Northern Dynasty Minerals is a pre-revenue and pre-commercial company that is simply holding onto the asset known as the Pebble Project. The major obstacle to development: environmental regulations. The U.S. Environmental Protection Agency had previously blocked the company's attempts to obtain the permits required for the expansive site to be prepared for decades of resource extraction. But even if the permitting process becomes a little easier thanks to an administration change, Northern Dynasty Minerals is still looking at a relatively large upfront expense. The company estimates that the permitting process alone will take up to four years and $150 million to complete. That could be a problem considering that it reported just $7.9 million in cash on its balance sheet at the end of September. While the company closed a share offering that grossed $37.4 million in late January, it also reported $33.5 million in operating expenses in the 12 months prior to the most recent quarter -- and that was before the permitting process even began. Management was wise to take advantage of a sky-high stock price to raise funds, but it seems likely that the latest share offering will be far from the last. That leads to a second major red flag on the balance sheet for investors to consider: dilution. In the span of just one year, from September 2015 to September 2016, investors saw the number of shares outstanding more than double from 131 million to 265 million. To be fair, without any operations to speak of, Northern Dynasty Minerals only really had two options for raising funds to keep the lights on: debt offerings or share offerings. The latter has the advantage of being relatively cheap, specifically since share offerings avoid interest payments. They are, however, devastating to shareholders. That's especially true considering a stock price hovering near $0.50 per share for the last several years required a lot of shares to be sold each quarter. If the latest offering is included, then the number of shares outstanding today is at least 285 million. 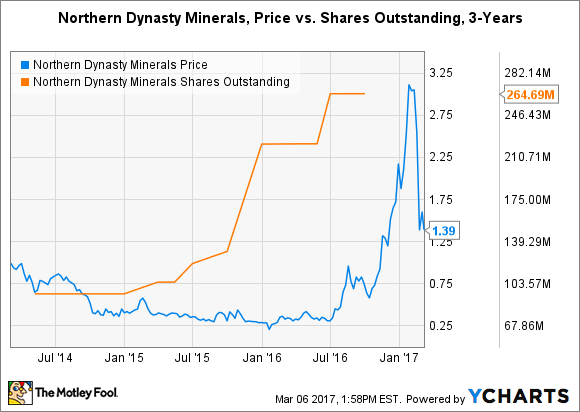 With its star seemingly rising, Northern Dynasty Minerals could potentially shun future share offerings and instead raise debt or find a development and production partner, as it says it intends to do, to help keep pace with what is expected to be an increasingly higher level of operating expenses. While the latter would help to de-risk the company's future, investors must also consider that it will come at the cost of reduced ownership in the Pebble Project -- another form of dilution. Furthermore, there's no guarantee that the permitting process will proceed or end favorably, which could have existential consequences for the company. And even if the permitting process goes smoothly from start to finish, the company is still facing hundreds of millions of dollars (or more) in development expenses, which may never lead to profitable operations. I simply don't see a way for Northern Dynasty Minerals to overcome the red flags on its balance sheet while prioritizing value creation for shareholders. There's a large gap between its current financial situation and the funding required to successfully complete the permitting process. There's an even larger funding gap between where the company is today and the day it executes its first commercial sale of minerals. Put another way: This is not a long-term investment worth making.